“The 5th edition of the Germán Bernácer Prize has been awarded to Prof. Philip Lane (Trinity College Dublin) for outstanding contributions to European monetary economics”. 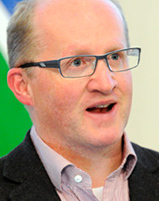 Philip Lane (Ireland) is Whately Professor of Political Economy at Trinity College Dublin and he was appointed Governor of the Central Bank of Ireland in November 2015. He is Chair of the Advisory Scientific Committee of the European Systemic Risk Board. He is also Director of the International Macroeconomics and Finance Programme at the Centre for Economic Policy Research (CEPR). He got his Bachelor degree in Economics at Trinity College Dublin and in 1995 he obtained his PhD in Economics at Harvard University. His research interests include financial globalization, macroeconomics of exchange rates and capital flows, macroeconomic policy design and European monetary integration. In 2010, he was co-recipient of the Bhagwati Prize from the Journal of International Economics. He has published widely cited papers in leading journals like American Economic Review, Review of Economics and Statistics, Journal of Economic Perspectives, Journal of International Economics, etc. The award ceremony took place in Madrid, on November 21st, 2001.